Amelia Island, Fla. – Racing is in Porsche’s blood and over the past 70 years the German sports car manufacturer has created some incredible racers; the 904, 917 and GT1 to name but a few. However, one of its creations stands as one of the most successful in all of motorsport and will be celebrated at the 2019 Amelia Island Concours. That car is, of course, the Porsche 962. Next year the Porsche 962 will be 35 years-old, hard to believe when it still looks the part today. The 24th annual Amelia Island Concours d’Elegance is to honor the prototype racing car that dominated America’s IMSA series. In that formula, the 962 won no less than 54 races with 1985 being its golden year, taking the top step at every event bar one. The 962 also won the prestigious Le Mans 24 Hour race three times. The 962 was born out of necessity as the Group C Porsche 956, that had won Le Mans in 1982, did not comply with IMSA safety regulations. This issue led Porsche to evolve the design of its first monocoque racer and create the compliant 962. When international rules changed in 1985, the 962C ended up replacing the 956 globally. Porsche’s 962 was ahead of its time with its extensive use of ground effects, something that kept it competitive for an unusually long period. Star drivers such as Mario Andretti and his son Michael, Indy 500 winner Al Unser and his son Al Jr., Derek Bell, and AJ Foyt have all claimed victory behind the wheel of a 962. 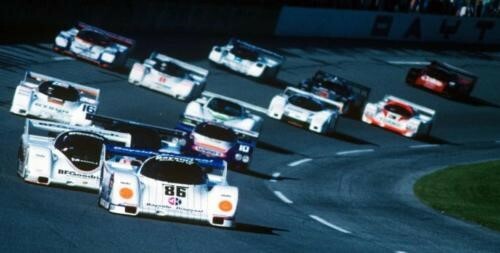 An amazing fact is that with victory at Le Mans as well as Daytona in 1986 and ’87, the 962 had technically been undefeated in 96 hours of endurance racing. Between its first IMSA win in 1984 and the final competitive victory in 1999, Porsche’s 962 tallied 142 victories and won 35 international championships. Now in its third decade, the Amelia Island Concours d’Elegance is among the top automotive events in the world. Always held the second full weekend in March, “The Amelia” draws more than 300 rare vehicles from collections around the world to The Golf Club of Amelia Island and the Ritz-Carlton, Amelia Island for a celebration of the automobile like no other. The 24th annual Amelia Island Concours d’Elegance is scheduled for March 8-10, 2019. For more information, visit www.ameliaconcours.org or call 904-636-0027.